It seems to be ages that I've written something for the Gywo-Bingo-Challenge :( But thanks to comment_fic I was finally able to come up with this. Every time he entered the old comic shop Casey felt like stepping into another world. The bustle of the Mall, crowded with people, loud music, and glaring lights were locked out here; a comfortable half-light and the smell of old books greeted him, colorful covers of comics and some merchandise, the big statue of a Ninja Turtle in the middle of the shop and Spiderman, crawling over the ceiling. 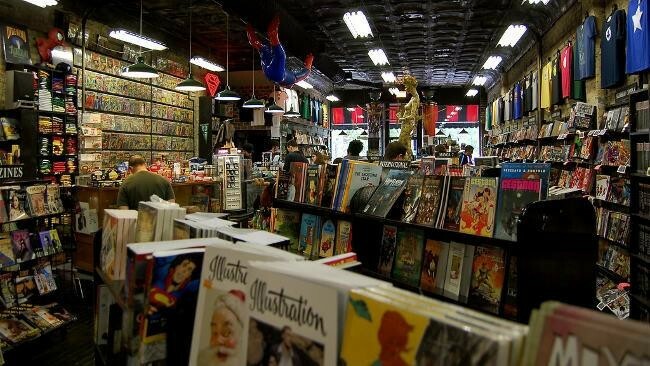 Usually, only a few walk-in customers were here, looking around, flickering through the comics. But often some folks that almost seemed to live here, like Casey. The gothic girl with her black-rimmed eyes and the friendly smile, or the boy with glasses, so thick that his eyes looked like tiny nobs. He somehow reminded Casey of Peter Parker who later would turn into Spiderman, one of Casey's favorite comic series. Around them, Casey felt comfortable. They were geeks like he was; no one would laugh about or even bully him like it happened almost every day at school. „Hello, Casey,“ the shop assistant greeted him with a wide smile. Casey's blue eyes were sparkling hilariously. The guy was nice; he knew how much Casey loved it to dig around through old, used comics. He was always looking for new reading material for little money. With the small pocket money he got, he couldn't allow himself larger purchases. „I've put them into the small booth in the back,“ the guy told him and winked. For the next hour, Casey forgot the world around him; the comics in the boxes were old but in a surprisingly good state. It was like heaven; some editions of famous comic series Casey collected, but also two unknown comics, he hadn't heard about before, were picked out soon. Finally, he went back into the sales room with twelve comics in his arms; hoping that his money would be enough to buy all of them. His eyes instantly fall onto a guy, he had never seen around before; a guy with brown hair, a bit messy, as if he would cut if by himself; tall and slender; tight jeans and a white shirt. He was standing in front of the shelf with rare comics, all of them in a protective sheet and pretty expensive. Casey could only dream about buying them … like he secretly dreamed about smart and hot guys. Guys, who would never have a look him, because they were always straight and could get every girl they wanted. Not willing to take his eyes off him; looking didn't hurt, right; Casey stayed in the background and watched the guy talking to the shop assistant, who listened and finally nodded, before vanishing in the back room. He smiled at Casey when he went past him. When he turned back to the guy he noticed his eyes resting on him blatant curious and a slight smile on his lips. Suddenly Casey felt uncomfortable; it was as if he could read his mind. For a moment he thought about it to leave the shop and come back later. But it was too late. The guy came over, still smiling openly. „Yeah,“ Casey murmured, wondering where this would go to. Casey needed a while to find out what he was talking about; oh yes, this Belgian comic which played in a post-apocalyptic world. The plot had sounded very interesting, so he had decided to give it a try though the story seemed to be darker than the comics he usually preferred. „I actually haven't heard about it before, too,“ he admitted. Casey thought about the Superman- and Batman comics in his hand and he inwardly cringed. There it was again. He was just the geek who preferred to read the usual stuff; it was so easy to see through him. The guy seemed to notice his uneasiness. „Nothing wrong with it,“ he reassured him. Casey couldn't help it, he giggled slightly at the very thought of this guy lying on his bed, devouring a Peanut-comic. In this moment the shop assistant interrupted them. „So, here we are,“ he said. The guy, Zeke, what a great name, seemed to think about this offer, finally he shook his head. „No, thanks, I was planning to go to Akron this weekend anyway; so I can go and have a look at it at the shop. He pulled out 10 dollars and handed it to the guy. „Always great to see you,“ the shop assistant answered with a wide smile. Zeke nodded to him shortly and then turned around to the door, obviously ready to leave. Casey felt some disappointment rushing through his body; he wished he would stay a bit longer and they could continue their talk. He needed a moment to realize that Zeke was talking with him. Slightly confused he blinked. If this was a dream, it was the best he had ever had. With a wild pondering heart, Casey nodded. This is delightful, Prisca. I love the setting and the way they met. I love it, when the muse is willing to play along :) Thanks for reading. :) Might be fun, right, to meet Zeke (or Josh ???) unexpectedly in a comic shop. Thanks for reading. I'm so happy that the muse starts to cooperate again.